Good quality blanket. Looks great on my bed. Snags easily. Thick, plush, and soft, this blanket from Vera Wang is woven from one hundred percent cotton tonal threads that give the blanket its signature textured look. Machine washable and available in Charcoal, Blue, White, and Grey. This seems like a really nice blanket, however, the color isn’t what I expected. The color is called charcoal on the website. The picture on the website definitely does not depict it correctly. It actually says charcoal/sable on packaging. I would recommend the high quality and craftsmanship/detail of this blanket. 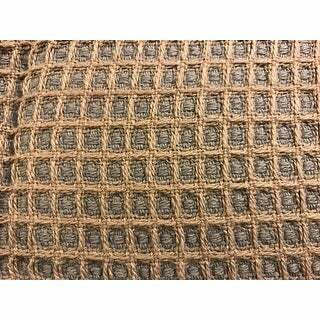 I love the visual texture of this weave and it's two-tone coloring, however my husband vetoed the raised waffle weave feeling on the skin, so I will be returning for a smoother weave cotton blanket! Ordered King size and it was plenty long for our king size bed. Just what we needed- so nobody is left with shortage of blanket on either side. I've added a picture to show color discrepancy. I ordered Fog, and it is much less blue than the stock photos would suggest, but I was just as happy with the actual color regardless! I really love our Vera Wang blanket! We actually bought 2 more for all of our beds & use them in our RV rental. 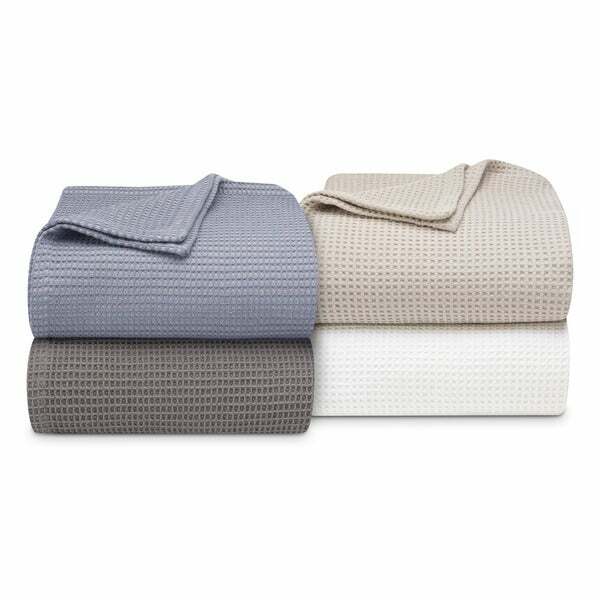 Even though it's not heavy weight-wise, the cotton waffle blanket keeps us warm on the cold nights with a comforter. On the hot nights, the blanket is a cool warm & easy to kick off. We really like that the blanket is a natural material versus polyester or velour. The blanket can be used as a bed cover because it looks so nice. After washing the blanket a few times, the color faded a little bit, but it still looks sharp because it has a natural "worn" type look. We bought the brown color. Vera just raises the bar with her quality and attention to detail. This blanket was a gift to my mom, who just bought a new mattress and would only cover it with Vera Wang sheets. She was thrilled to add this to the new bed, and she's been happy with it since. I am in love with Vera Wang This white blanket is so special i won't allow my husband to go to bed before he washes his hands sounds crazy i know but you have to appreciate the value and the fell of the texture. WOULD PURCHASE OVER AND OVER AGAIN! 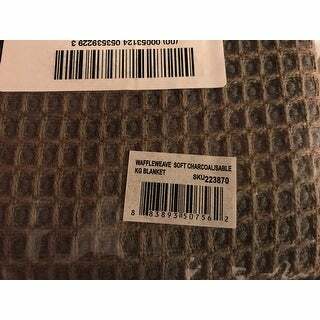 We purchased this blanket in the brown color -- it is a nice, heavy blanket and the quality is exceptional! This cotton blanket is beautiful and warm. I am very surprised how warm the blanket is. These cotton blankets are great. They are a little thicker than most cotton blankets I have had in the past and don't stretch out easily like some do. I've looked around for quite a while to find a blanket that was thicker. The colors are great and they provide nice warmth. I suspect that after a washing, they will thicken and tighten a bit more. I really like these. Great quality blanket. I would definitely recommend purchasing this. You can not beat the price for the quality. I wish they had more colors to choose from. I use this on my bed for the master bedroom. It stays on the bed and slide off like other blankets do. This blanket was perfect in terms of how light it is but it still keeps you warm. I use it under a comforter, but it shrunk a lot in the dryer and a ton of lint came off. A wonderful blanket. Generous size. Feels like perfect weight when sleeping. Love it! Better then we had hoped for ! ! ! 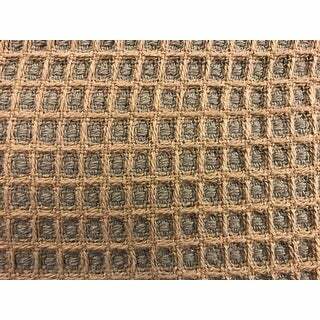 Seems quite rough and you feel all the waffleweave fabric. Purchased this for my clients master bedroom as a bed blanket. Beautiful color, great hand, nice weight. 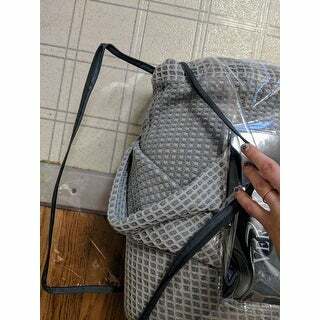 Great quality and excellent price. Thinking about purchasing one for my bed it was so nice. This Waffleweave cotton blanket is the best blanket I have ever purchased. Washes beautifully and is warm, yet not heavy for spring and summer months. I have purchased three and no complaints, whatsoever. This blanket was not at all what I was expecting. First off it’s very heavy. The texture of it is not really soft at all. And on top of that I opened it from the package and there was a disgusting crusty stain on it. Definitely going to be returning this. As long as you understand what you are getting, which is a lightweight blanket to go under a comforter, this is very nice. Good looking and nice material. Perhaps could standalone if but this is really designed to be under a comforter. Positive reviews included all the features I was looking for : a heavy warm blanket, easy to care for. "What color is fog? Is it a light gray?" Yes, sort of a pewter color of grey. It isn't the blue grey that it looks like in the photo at all. But still a nice color.